As much as I love vintage photo filters and film-styled effects, there’s only so many ways to make a photograph look nostalgic, and that’s why I love it when developers push themselves to break the mold. But given the massive success of photo effect apps and the giant that is Instagram (which seems to be the blueprint for all photo apps), you’d think the creativity well had all but dried up. 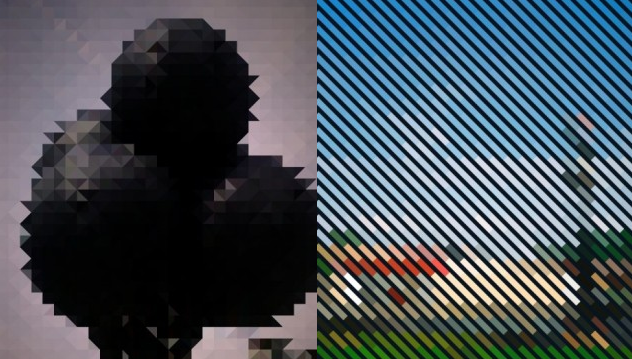 pxl, a trippy iPhone and iPad app that turns ordinary photos into abstract, pixelated compositions, shows that effect apps still have hope. The 99¢ app grabs the color and shade of your images and generates vectorized works of art out of shapes and lines. The results vary greatly from photo to photo, but if you play around with it enough, you’re bound to find a sweet spot with wild results. Because of processing power limitations, the app outputs images at 640×960 on the iPhone or iPod Touch and 768×1024 on iPad. Some users have complained about this, but honestly it shouldn’t be a problem as long as you weren’t planning on blowing your results up onto a canvas. Limitations aside, pxl really is an impressive app worth a spot next to your run-of-the-mill photo effects apps for some much needed creativity!